The Audi Q7 from 2007 – 2013 comes fitted with a Magneti Marelli manufactured instrument cluster (speedometer) unit. Some Speedo’s can fit a variety of vehicles, however this particular part has only been found fitted to the Audi Q7 and is specific to this model of vehicle. 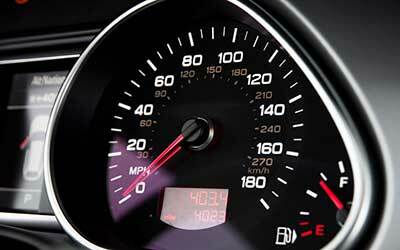 We have had quite a few Audi Q7 Speedo units in for testing & repairs and have seen various faults. If you have a faulty instrument cluster on your Q7 Audi, you may have been advised that it cannot be repaired and will require replacing. Unfortunately new replacement parts can be very expensive and will require coding. Second hand replacement parts may be a little cheaper to buy but because these parts are coded (programmed) to the vehicle, they will need reprogramming which can be an additional cost. Both options of replacement will come with a limited warranty – new parts typically have a 12 month warranty and used parts have 30-90 days warranty. We are able to fully test & repair the Audi Q7 instrument clusters and using new genuine OEM components we can ensure that each and every speedo repair will meet & exceed OE specifications. We guarantee that once you receive the rebuilt part back, no programming or coding will be required. The unit will be completely plug & play. Below is a list of the common part numbers we’ve had in our workshop for testing & repairs. If you’re part number is not listed or you have any queries, give us a call on 0844 847 9999. Tags : Audi Q7 Dash Cluster Problems, Audi Q7 Instrument Cluster Repairs, Audi Q7 Speedo Not Working. Can you help with an advice ? I’ve sent you over an email now with further information and pricing regarding your Audi Q7 Instrument Cluster but if you have any questions please respond to the email and I’ll get right back to you. I have a 2008 q7 Sline with Adaptive cruise control, 4.2L v8 premium and air suspension. a few days ago I got a wire burning smell and realized that the lcd panel in my cluster was no longer working. everything in the cluster works fine except for the middle lcd info panel. i had it inspected by a local repair shop, but they stated that it was not repairable. I’m also in atlanta GA USA. We’ve sent you an email with pricing and information if we can repair it but as it’s already been opened we would need to inspect it first to confirm whether a repair is possible. We carry a large stock of replacement cores and can normally repair clusters without any issue. I have an 2007 Q7 3.0TDI. The LCD in the Istrumentcluster will not work before aproxemently 20 minutes after I have started the car. IT is compeletly black, but when it starts up, it works perfect. All the rest of the instrumentcluster works fine. Is this just a Bad connection, or do you have experience with component fault that can occur this problem? It would definitely be worth cleaning up the connector plugs first and then seeing how you get on with it, also check all the input signals to the instrument cluster to see if there is a signal fault but otherwise yes we would be suspecting component failure inside the cluster. I have sent you an email with pricing and some information. How much do you charge to repair the lcd please? “I have an 2007 Q7 3.0TDI. This is a fault we have successfully test & repaired in many Audi Q7 units. I have sent you an email with full information and pricing. If you have any questions, please reply to the email and we’ll be happy to assist you.